BHP Infrastructure, that represents Rubblemaster in India, held a demonstration of compact recycling in Mumbai where road demolition waste was recycled into sub-base material. Rubblemaster introduced the concept of compact recycling in 1993 and has been devoted to setting standards in environmentally acceptable recycling. The purpose was to demonstrate the use of Rubble Master Compact Recycling for converting road demolition waste into GSB that meets specifications. The demonstration was held at Thadani Chowk, Khan Abdul Ghaffar Khan Road, Worli Seaface, Mumbai on 1st and 2nd December 2009, and was attended by Mr. DL Shinde, Chief Engineer (Roads and Traffic) of the Municipal Corporation of Greater Mumbai as well as heads of leading construction companies and contractors of Mumbai. 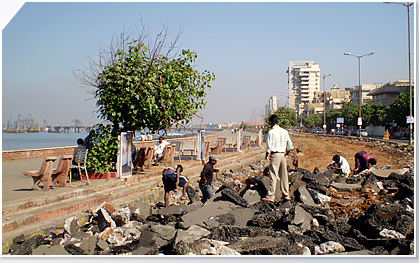 Cities like Mumbai, Kolkata, Chennai, Delhi, Hyderabad and Bangalore have re-usable Construction and Demolition materials produced through road demolitions, building demolitions and rock excavations. With the extent of infrastructural reconstruction that is required to convert these cities into modern cities a very large quantity of C&D waste will be generated. Worldwide, city administrations have adopted green building standards requiring the maximum re-use of building demolition and excavation material at site. As an example the City of Los Angeles requires “that road base in all city projects include crushed miscellaneous base (CMB) with 100 percent recycled asphalt, concrete, and other inerts, except when site conditions or standards require another specification." Compact recycling means sorting the materials to be processed into grade groups right on the job site. Sorted, high quality recycled building materials can be used (best of all in their entirety) directly at the work site or at a nearby building site.